and is signed by the artist. An outstanding new painting by our own highly acclaimed and collected artist Philip E. West. 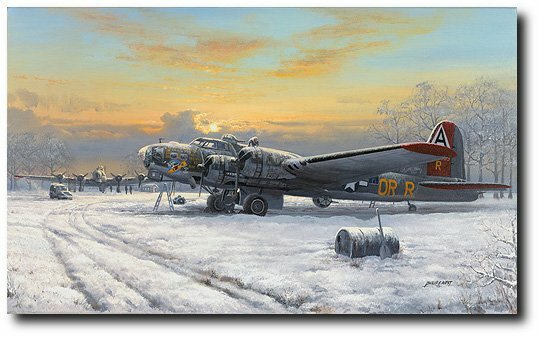 By any standards a fabulously evocative painting, of one of the most remarkable aircraft to have flown during World War 2. Check out the detail on the nose of the aircraft, the ground crew braving freezing cold weather to get their favourite aircraft ready for when the crew arrive, look at the trees and ground - that's how it was in those days! The sun rising, though, gives you a sense of warmth as well as reassurance this mighty bomber will once again be able to take to the skies that day and in so doing, contribute to our very own freedom now. "Nine O Nine" awaits her next mission over occupied Europe. Part of the 91st Bomb Group, 323rd Squadron, this B-17 went on to complete a record mission tally of 140 without an abort or loss of a single crew member. She started operations in February 1944. By April 1945 "Nine O Nine" had flown an extraordinary 1,129 hours. This aircraft and crew represented just one of many who fought in war-torn skies for the freedom we now enjoy". This print edition is fully signed and numbered by the artist.